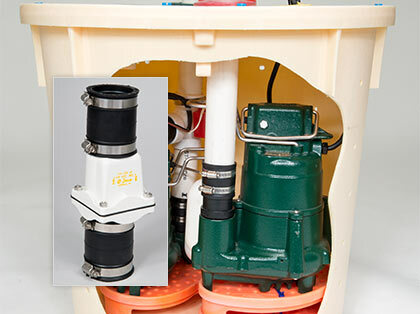 Even if your system has an existing check valve, it's best to replace it when installing a new sump pump, just in case minerals have corroded or damaged the valve flap. All sump pumps installed by an authorized Basement Systems dealer include a check valve. A check valve on the discharge line keeps water in the pipe from flowing back into the sump pit when the pump switches off. A check valve is sometimes referred to as a "one-way" valve because it allows water (or any liquid) to move in one direction only. To appreciate how a check valve helps your sump pump system work more effectively, think about what happens when no check valve is present: Your sump pump will turn off automatically after a certain amount of water is pumped out of your sump pit or sump liner. The water that remains in the discharge pipe will fall back into the sump pit, raising the water level again so that pumping will need to resume. Forcing a sump pump to move the same water twice can cause the pump to burn out prematurely. By installing a check valve in the sump pump's discharge line, you can avoid pumping the same water twice. Our specially-designed sump pump check valve is only available from a certified sump pump installer in your area. Contact Basement Systems today to request a consultation and get a free cost estimate on a new sump pump system.